Woodmont Doors drawer boxes are clear coat finished solid maple. 5/8" thick sides with a finished maple plywood 1/8" thick bottom. Shipped unassembled. Color pictures we took will follow after the Woodmont Doors catalog information pictures. * NOTE: Custom heights are no longer available. You will need to select from the standard heights of 3-1/8", 5-1/8" or 7-7/8". The only measurement for drawer boxes that can be customized is the width. This is to match your varying widths in your kitchen or bath. So heights now come only in those 3 standard measurements. No more custom on the height. Drawer box pricing is done via a request on our on-line quote form, fax form, or over the phone (for short lists). And yes, the cabinet doors and accessories can be shipped ANYWHERE in the USA. Doors can be shipped to Canada and other countries too. The drawer box must fit into your opening. When measuring for width, you must know how much space your drawer slides take up on the left and right of the box, if side mounted slides. For example, if the slides require 1/2" on each side, the slides take up 1" of your opening width. If your opening width is 18-3/16" wide, you would order a 17-3/16" wide box. If you have a different kind of slide, such as undermount or monorail, you should leave about 1/4" of space on each side of the drawer box to keep it from ever reaching the sides of your opening and thus dragging or scraping. As for height, it's variable, but drawer slides can dictate how much of your opening height can be utilized. Overall, if your drawer box height is 3/4" to 2" less than the opening height, you should be fine. But you do have to select from one of the 3 standard heights: 3-1/8", 5-1/8", or 7-7/8". Depth: drawer boxes come in 15", 18", and 21" depths. Select the one that fits in your cabinet depth. If you need to trim your depth to make it shorter, you can do this. 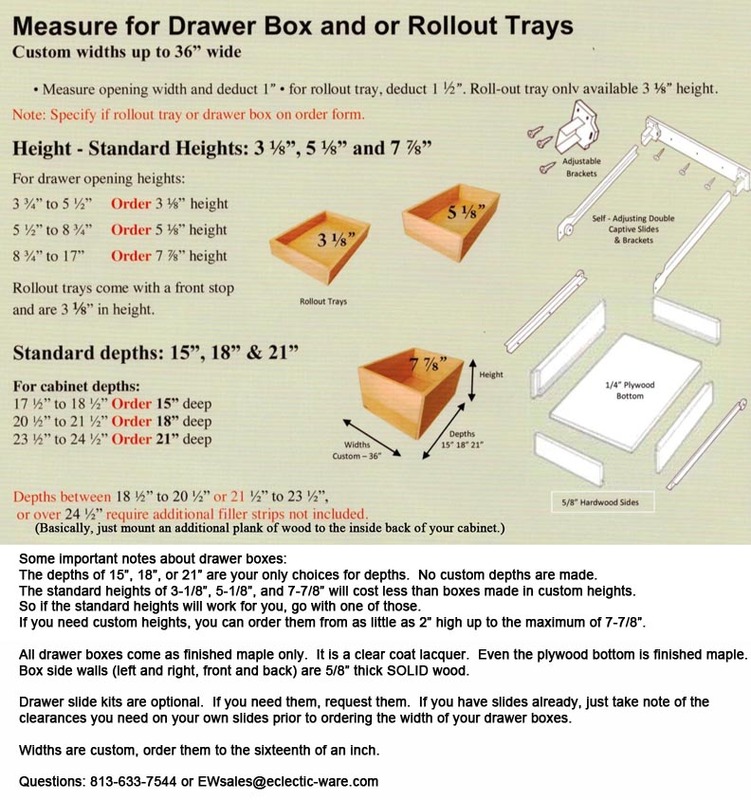 Drawer boxes come in 3 standard heights only: 3-1/8", 5-1/8", and 7-7/8". Drawer boxes come in 3 standard depths only: 15", 18", and 21". Drawer boxes come in custom widths ranging from 4" up to 36". Measure to the sixteenth of an inch. Drawer slide kits are optional from Woodmont. If needed, please order them. They are a bottom mount "wrap around" slide. They take up 1/2" slide clearance. Thus your drawer box width must be 1" less than your opening width. The slide kits come with rear mounting sockets for face frame installations (the more common kitchen cabinet type). The slide kits come in 3 sizes for the 3 standard depths of drawer boxes. On our ordering or quotation forms, you will just note in the comments that you need drawer slides. If you already have slides, no need to make any notes unless you want to say you already have slides. It's not hard. Start with measuring the opening the drawer box will slide into: width, height, and depth. If you plan on using the drawer slide kits from Woodmont, then the width of your drawer fronts will need to be 1" less than your opening size. If using other drawer slides, you will need to know their "side" clearance to determine the proper width of your drawer boxes. Determine that width. Select the standard height and depth needed for your boxes. Enter all that info on our quotation/ordering form and we will do the rest. If you would like drawer slide kits from Woodmont, note that too. ** There is something called a roll out tray. This is the same drawer box, but with a modified front side to make it a bit more decorative. Sometimes banks of roll out trays will rest behind a cabinet door. This is the only time you would want to select this option. And it is 3-1/8" tall. Below are additional color drawer box images we took to assist you with your selections. The drawer boxes ship unassembled. So we are showing them that way, and then assembled. And we are showing the slides and rear mounting sockets available in slide kits from Woodmont Doors. On the rear mounting socket shown above, notice that the picture on the right, is NOT the same picture. We are showing you the left to right adjustment of the rear mounting sockets. Notice how the part the slide would fit into is shifted to the right in the picture on the right. This give you side to side adjustment after they are installed. Not all of us get the slides parallel on the first try. This adjustment makes tweaking them easier. Woodmont Door drawer box spec diagram.